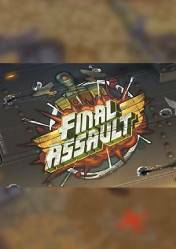 Final Assault is only available in digital version and can be purchased directly from the Steam store, or through digital keys in other online stores. It can be available in cd key format or in "Steam Gift" format, so pay attention to the format you are going to buy in each one of the stores. All Final Assault prices and the stores where this game is available are constantly updated and changed. Daily from Gocdkeys we update all prices and offer the best price comparison service for PC games for the Steam platform. And what does Final Assault offer us? This is a strategy game set in World War II. Up to here it can be one more strategy game, although all the action takes place in a virtual reality environment, and this is where it differs from the rest of the genre. Final Assault focuses entirely on combat between armies, eliminating both base building and resource gathering. At our disposal we will have all kinds of vehicles, jeeps, tanks, artillery and aircrafts, with which we will be able to mount the most imposing land and air battles. We will have total control of our armies and will make strategic decisions based on the troops we deploy in the battlefield. The game is compatible with the main virtual reality platforms, such as Oculus, HTC Vive and WMR. There are no comments yet about Final Assault. You can be the first one!